Description: Ben 10 is driving his tanked motorbike with a machine gun on the back of motorbike that can shoot at any direction. The Zombie are attacking on the land and they bite everyone on their path. 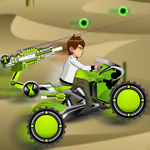 Help Ben10 kill all the zombie by collecting green energy to upgrade his motorbike.